Ashley Brown & Jeff McCarthy in "My Fair Lady"
Astonishingly, the current Cape Playhouse production of “My Fair Lady” is the first ever in the 89 year history of the company. The hugely successful and universally praised 1956 Broadway musical, with Lyrics and Book by Alan Jay Lerner (based on George Bernard Shaw's 1912 play “Pygmalion”) and Music by Frederick Loewe, won six Tonys including Best Musical. Shaw's play had been filmed in 1938 (winning him an Oscar for adapted screenplay). The musical was subsequently adapted for the screen in 1964, winning Oscars for Best Film, Director and Actor as well as five other Academy Awards (infamously not including the miscast, clearly dubbed and unnominated Audrey Hepburn). While Shaw's concerns were about the inequitable distribution of wealth, the unjust English class system, and the submission of women (a man surely ahead of his time), the musical was much more of a love story. It was blessed with an incredibly lovely score that led to the original cast album's two-year chart-topping status and produced such popular hits as “I Could Have Danced All Night”, “I've Grown Accustomed to Her Face”, and “On the Street Where You Live”. (The latter was conceived as a throwaway song included in order to make a major set change in the days before today's complex technical expertise). The choice of this work as the centerpiece of Cape Playhouse's season was a risky one, considering how well received the original stage musical, film adaptation and several revivals were. The question was whether this revival of the beloved musical would measure up to its storied past. One needn't have had any concern, as, despite the requirements of the piece, this version is a winner. Directed by Tony-nominated Hunter Foster, this production's Eliza Doolittle is Ashley Brown (Broadway's memorably supercalifragilisticexpialidocious “Mary Poppins”, soon to be portraying the Mother Abbess in the National Tour of “The Sound of Music”) and its Professor Henry Higgins is Jeff McCarthy (“Urinetown”, “Side Show”, “Chicago”). As the Cockney flower seller, Brown is totally believable, as is her transformation into high society; equally important, her vocal chops are amazingly perfect from the moment she bursts into song (with “Wouldn't It Be Loverly?”). As her professor of phonetics, McCarthy is also perfectly cast, managing the difficult balance of pomposity and endearing curmudgeonliness seemingly effortlessly, with a fine voice to boot. The roles of Higgins' sidekick Colonel Pickering (Ed Dixon), Eliza's suitor Freddy Eynsford-Hill (Constantine Germanacos), Mrs. Higgins (Catherine Flye), and the housekeeper Mrs. Pearce (Ruth Gottschall) are all impeccably performed. And in the crucial role of Eliza's dustman father, Alfred P. Doolittle, James Brennan plays with gusto (with two opportunities to shine in his numbers “With a Little Bit of Luck” and “Get Me to the Church on Time”). The ensemble dances and sings with remarkable skill and energy, which is more than can be said for the relatively bland rendition of “The Rain In Spain” sung by the principals. The Direction by Foster and Choreography by Lorin Latarro are by and large superbly executed for the Cape Playhouse stage. There are a few directorial missteps (the scene at Ascot, for example, with touches that are quite funny but inappropriately anachronistic for the setting in 1912), but they're overshadowed by the general excellence of this production. The technical contributions are all effective, from the ingenious Scenic Design by Jason Sherwood, to the very well-executed Costume Design by Gail Baldoni, and the Lighting Design by Erik Fox and the Sound Design by James R. McCartney. The fine Musical Direction (and reduced orchestrations) were by Nick DeGregorio, who at one point had to deal with a blackout in the pit. One might envy the newcomer to this piece of musical royalty; familiarity with the story and score (even to the anticipatory song cues) can impact one's full enjoyment of the play. But even if it's a well-remembered treasure, it's still a treasure today as much as it was in its first incarnation almost sixty years ago. In short, while we've often walked down this street before, the pavement won't stay beneath your feet. Don't miss this one, but get tickets while you still can. It's only here until August 8th, so it's time you moved your bloomin'.....well, you know. 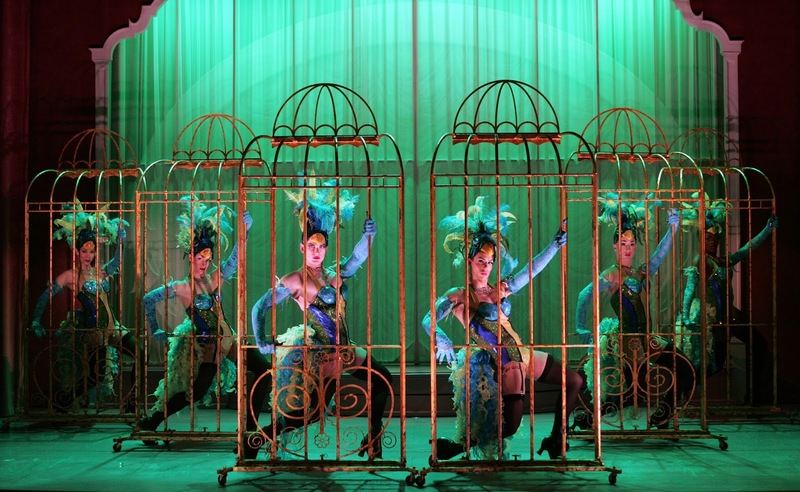 Les Cagelles in "La Cage aux Folles"
The 1978 film “La Cage aux Folles”, based on a play by Jean Poiret, was a surprise hit (given that it was the story of a gay couple, in French with subtitles) when it opened, becoming the highest grossing foreign language film in U.S. History. There were two French sequels, as well as a non-musical English language remake in 1996 that was less memorable. Perhaps most surprising was its subsequent success in 1983 as a Broadway musical. With a Book by Harvey Fierstein and Music and Lyrics by Jerry Herman, it probably shouldn't have been such a big surprise. It went on to be nominated for nine Tony Awards, winning six, including Best Musical, Book and Score, and ran for four years. Its Broadway revivals in 2004 and 2010 both won Tony Awards for Best Musical Revivals as well. 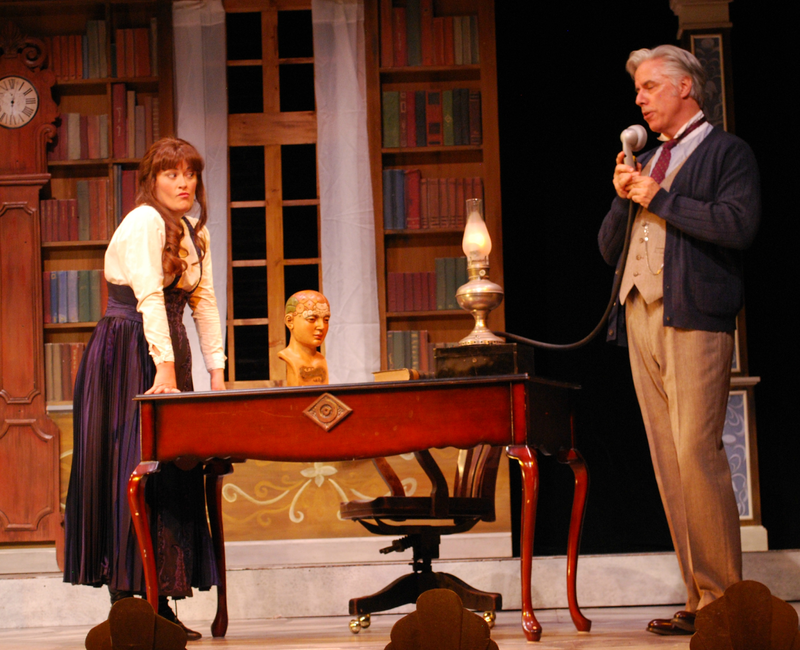 The current Goodspeed Musicals version has a stupendously talented cast of twenty-one and an awesome creative team who've pulled out all the stops for this one. The setting is a drag nightclub in St. Tropez, managed by Georges (James Lloyd Reynolds) and starring his romantic partner of twenty years and headlining entertainer, Albin (Jamison Stern). All's going reasonably well until Georges' twenty-four-year-old son, Jean-Michel (Conor Ryan) wants his father to meet his fiancée Anne (Kristen Martin) and her ultra-conservative parents (Stacey Scotte and Mark Zimmerman, the latter being the Deputy of the Family and Morality Party). Also involved are Georges' and Albin's butler (who prefers to be called their maid) Jacob (Cedric Leiba Jr.), and their friend Jacqueline (Sue Mathis), owner of an upscale restaurant. And then there are those dancers in the nightclub, Les Cagelles! Suffice it to say that once all these characters intermingle, as they say, hilarity ensues. The story is a wise and witty one, at full throttle in this marvelous and unforgettable production both with respect to the performances (by a flawless cast of twenty-one) and the inventive creative team. Leading the cast in every sense of the term is Stern, whose turn as the diva of the day is utterly mesmerizing, at one moment hilarious, at the next, heartbreaking. Giving tremendous support are Reynolds as his devoted lover, the bedimpled Ryan and Martin as the charming newly engaged couple, the uptight twosome of Scotte and Zimmerman, and the over-the-top terrific scene-stealing Leiba. The barbs fly effortlessly, as does the singing. They all do great justice to the score which, while consisting of only nine songs (several of which are reprised), has some true standouts, notably the lovely “Song on the Sand”, the moving gay anthem “I Am What I Am” and the most popular, “The Best of Times”. But its the stunning Direction by Rob Ruggiero (who helmed last season's unforgetable “Fiddler on the Roof” for Goodspeed), and the wondrous Choreography by Ralph Perkins, that make this production near-perfect, especially with regard to those aforementioned Cagelles: Darius Barnes, Michael Bullard, Alexander Cruz, Wade Dooley, Alex Ringler, Nick Silverio, and Nic Thompson, as well as (surprise!) Erin M. Kernion and Barbara McCulloh. The work of the creative team includes fabulous Costume Design by Michael McDonald, breathtaking Scenic Design by Michael Schweikardt (awash in pink, no less), excellent Lighting Design by John Lasiter and Sound Design by Jay Hilton, with superb Musical Direction by Goodspeed regular Michael O'Flaherty. Given a certain recent Supreme Court decision, the show is more relevant and resonant today than ever, a true marvel of our age, and a “La Cage” for the ages. This is indeed “The Best of Times”, the perfect time for "La Cage aux Folles" to come out fully from that age-old closet. 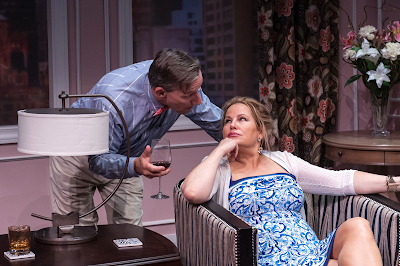 Alexander Cook & Jennifer Coolidge in "Saving Kitty"
A local theater near you has just pulled off quite a coup, with a starring role in its current production played by a star in her own right, local native Jennifer Coolidge. As noted elsewhere on this website, ask someone what their favorite Jennifer Coolidge role is and you're likely to have quite a few answers. While some might opt for the hilarious characters she played in Director Christopher Guest's films “A Mighty Wind” or “Best In Show”, others might choose one of her numerous appearances on several television series. This critic would vote for her beautiful creation of the manicurist Paulette (with more than a passing interest in the UPS deliveryman) in the “Legally Blonde” movies. Even with such varied comic roles already on her resumé, it might surprise some fans to hear that she's taken on a part that's a further challenge for this versatile actress, in a live theater production. The play is “Saving Kitty” by Marisa Smith, which Coolidge first did at a staged reading in Williamstown. The play received its world premiere at Wellfleet Harbor Actors Theatre in 2012, and, from WHAT, it's now transitioning, with Coolidge, to none other than the Central Square Theater in Cambridge by the Nora Theatre Company. One may now add another likely candidate for one's favorite Coolidge role. This play centers on an urbane and wealthy Manhattan matron, Kate Hartley (Coolidge). Living in a swank Fifth Avenue apartment, ostensibly ultra-liberal, she and her husband Huntley Hartley (Alexander Cook), a U.N. official, have become a rather bored couple, purportedly both agnostics. The impending arrival of a singular dinner guest, Paul Cook (Lewis D. Wheeler), the new beau of Kitty (Lydia Barnett-Mulligan), their television-journalist daughter, changes all their lives, especially that of Kate, whose unedited barbs are priceless. The couple speculates about this new boyfriend whom they are about to meet, as they reveal some hitherto unrevealed biases they share toward certain religious evangelicals, confusing them with the subset of fundamentalists and creationists. Certainly they're fair game for satire, and the playwright skillfully skewers them. Underlying the more obvious issue of religious prejudice, though, is the gradual, shrewd and unquestioned expectation that wives, implicitly and explicitly, should make their husbands the center of their universe. This is expressed through the focused Direction by Lee Mikeska Gardner, Artistic Director of the company (whose program notes, however, are disappointingly sexist), predominantly through Kate's frequent witticisms. Coolidge is more than capable of delivering her character's slings and arrows with superb deadpan timing, and Cook's long-suffering husband has a battery of fine facial expressions to counter her relentless forthrightness. The technical effects are all outstanding, from the gorgeous Scenic Design by Steven Royal (with clever subtle accents like the illuminated portrait of Kitty on one wall), to the effective Lighting Design by John R. Malinowski and Sound Design by Jennifer Timms, to the detailed Costume Design (down to a bejeweled hair clamp) by Barbara Douglass. The production has some pacing issues, which with more performance time and a healthy dose of tightening will no doubt improve, and the ending doesn't sizzle but fizzles. The trip to Central Square is worthwhile, however, for all the quips that Coolidge lands (including a hilarious take on the “Second Coming” and her dismissal of her Biblical knowledge as her “great mind for trivia”), as well as those of Cook (at one point declaring that “life is a pause between two eternities”, and elsewhere that “life is war with intermissions”). There are also several mimed bits with an (uncredited) prop-changing “waiter” that are funny in themselves. Thanks to Smith's writing and Coolidge's acting,“Saving Kitty”, in the end, unquestionably redeems itself. in Priscilla Beach Theatre's "Fiddler on the Roof"
The stakes were high; would the rich history of the barn known as Priscilla Beach Theatre, with its ghostly presences of Gloria Swanson, Paul Newman et al, live anew? Pause for a hearty and heartfelt sigh of relief. Fifty years after its Broadway debut, this company is presenting a lovely revival of the beloved musical “Fiddler on the Roof”. Back in 1964 this concept was considered a risky one when Composer Jerry Bock, Lyricist Sheldon Harnick and librettist Joseph Stein first proposed it. In the publication of the book for their earlier musical collaboration, “She Loves Me”, they alluded to a work they were planning based on “Tevye and His Daughters” by Ukranian Sholem Aleichem. A musical set in a Jewish shtetl, about a poor milkman with five dowerless daughters amidst pogroms in czarist Russia? Crazy, no? Yet it ran almost eight years on Broadway, having received ten Tony nominations, winning nine (including Best Musical). The 1971 film version earned eight Oscar nominations and won three of them. It has been revived on Broadway several times since, and is due for yet another this coming season. Clearly this work is, as Tevye himself might say, one in a minyan. One might criticize such devotion to traditions (especially those that morph all too frequently into laws), as expressed in the song “Sabbath Prayer” (“strengthen them, O Lord, and keep them from the stranger’s ways”), but it’s still a very popular story, with a phenomenal multi-leveled score. Bock and Harnick were never better. Who can ever forget “If I Were a Rich Man” (never sung more exhuberantly than here by Bernardi), “Miracle of Miracles” (never performed more powerfully or with such chemistry as by Feldman and Lester), and to “To Life” (rarely as lively as here) , or the poignant “Do You Love Me?”, “Far From the Home I Love”, and the finale, “Anatevka”? And then there’s “Sunrise, Sunset”, in a class by itself, with its exquisitely moving wedding scene. It was an evening of great moments, from the trio of “Matchmaker” (never as enjoyably staged and executed as here), to the awe-inspiring vocal chops of Samuel Patch, the exquisite dancing by Jacobson in “Chavaleh”, to the truly show-stopping turns by the marvelous Caitlin Donohoe as Grandma Tzeitel and the aforementioned Suuberg as Fruma Sarah in “The Dream”. The score is given full force by the performances of the entire cast, led by the wonderful Bernardi, who emerges as larger than life without ever becoming a cartoon, a perfect Tevye in his warmth and wisdom. He’s firmly backed up by a strong Morse and a hilarious yet quite humanized Adam Andrianopoulos as the Butcher Lazar Wolf. Under the sensitive and detailed direction of Ron Fassler (who shows his intimate appreciation of the show at every turn), the huge cast of over two dozen is fabulous both individually and as a unit. They include the very natural four younger actors: the other two daughters, Shprintze (Emma Sundstrom) and Bielke (Emma Gilmore), and Oliver Trask and Dimitri Jesse, who represent the future of the community (and that of Priscilla Beach Theatre as well). The dancers, especially Charlotte Hovey (the production's Choregrapher), Benjamin Gibson, Bryan George Rowell, and Ira Colby, created some gravity-defying moves. Then there are the stalwart Eli Hovey as Mendel, the versatile Emily Borges as Mordcha, the menacing Joshua Patino as the Constable, and, in the most charming touch, the on-stage presence of a real live fiddler (Lilly Innella), invoking the 1908 Chagall painting of “The Dead Man”, a fiddler on a rooftop, which initially inspired Stein’s book. All of the technical credits are extraordinary, from the clever and fluid Scenic Design by Kelleher Fine Builders to the perfect Costume Design from the genius of Richard Danehy, to the complex Lighting Design by Kasey Sheehan (especially in “The Dream”), to the meticulous Music Direction by Christopher Ricci leading an eight-piece orchestra. “Wonder of wonders, miracle of miracles”, indeed. There is, in the end, only one negative reaction to this production: it has to end (though there are a few tickets left for the run which ends July 25th). This production provides a “Fiddler” of basic simplicity yet also great beauty, one for all ages, performed by a predominantly youthful troupe (though ranging in age from ten to seventy-one). As Tevye himself might put it, it’s a blessing. And as Solomon puts it in her historical book: “(Tevye) wonders if (the townsfolk) might some day meet on a train, or ‘in Odessa, or in Warsaw, or maybe even in America’. In all those places, and far beyond, the world has met-and embraced-him. He belongs nowhere. Which is to say, everywhere." The stars are in perfect alignment for an unprecedented peek behind the scenes of the forthcoming Priscilla Beach Theatre (or “PBT”) production of the beloved musical “Fiddler on the Roof”. This critic is privileged to be able to report on its progress from the first “stumble-through” reading to the final stages of preparation of this promising production. As most theatergoers will recall, this is the story of the close-knit community that inhabits the (mythical) Russian town or shtetl of Anatevka in 1905, centered on the family of Tevye the milkman. In this incarnation, it has never been truer that it takes a village to portray the (not remotely mythical) history of the plight of a people under Czarist rule. There are some two dozen actors (all of whom are singers and dancers as well) who inhabit this Anatevka, from local towns such as Plymouth, Duxbury, Brockton and Fall River, to more distant cities like New York and Los Angeles. It becomes apparent at their first encounter that this is quite an unusual assembly, both geographically and professionally, of talent for regional theater. Not since PBT's former famed days as a true summer stock venue (with the likes of Gloria Swanson, Paul Newman, Estelle Parsons, Rob Reiner, Peter Gallagher and Jennifer Coolidge) has there been such palpable excitement. You can sense it in the enthusiasm of the youngest members of this troupe (which ranges in age from ten to seventy-one). Oliver Trask (who'll make a fine Harold Hill in “The Music Man” someday), Dimitri Jesse (a future “Aladdin”, for sure), and Ira Colby (a future Max Bialystock in “The Producers”, if there's any justice in this world) join other graduates of PBT's children's actor training program, the two Emmas, Sundstrom and Gilmore (no doubt future Maria von Trapp and “Annie”, respectively). The enthusiasm quotient doesn't end there, though. There's just as much in evidence with the more experienced cast members, from Tevye's three eldest daughters, played by Jenny Lester (deserving of a future “Funny Girl” role), Katy Corbus (one perfect pick for the role of the Baker's Wife in “Into the Woods”) and Maya Jacobson (someday a wonderful Elphaba in “Wicked”), not to mention the multi-talented trio of Emily Suuberg (who plays more than one role, not to be disclosed here, a perfect potential Adele in “Die Fledermaus”), Emily Borges (a future fabulous Belle in "Beauty and the Beast") and Caitlin Donohue (a fine choice for a future Amneris in “Aida”). The child actors are all adorable, the women more than merely attractive. The same could be said for the male contingent, from the daughters' suitors, played by Philip Feldman (a terrific choice for Leo Frank in some future production of “Parade”), Jeremy Fassler (who'll make a memorable Eugene Tyrone in “Long Day's Journey into Night” one day), and J.J. O'Sullivan (a fine future “Hamlet”, no doubt). In this production, even the “heavies” (that is, the Cossacks) are handsome, namely Sam Patch (a great future Judas in “JC Superstar”), Bryan Rowell (made for the role of Henry in “Next to Normal”) and Charlotte Hovey (who is also dance captain, and would be great as Anita in “West Side Story”). Then there's Ben Gibson, a born dancer (and a likely future Buddy in “Elf”), Eli Hovey (a real musician who could easily assay the role of Elvis), Josh Patino (a natural for “Glengarry Glen Ross”), Kenny Donovan (another future Leo Frank in “Parade”) and the funny Adam Adrianapolous (who also could do a mean Max Bialystock...is there a theme here?) who seems to have been separated at birth from Sancho Panza of “Man of La Mancha”. But any “Fiddler on the Roof” is, at its heart, only as good as its two main protagonists, Teyve and his wife Golde. This production is doubly blessed with the presence of two creative actors with theatrical DNA in their veins. Teyve will be played by Michael Bernardi, whose father Herschel was of course one of the most memorable interpreters of the part. 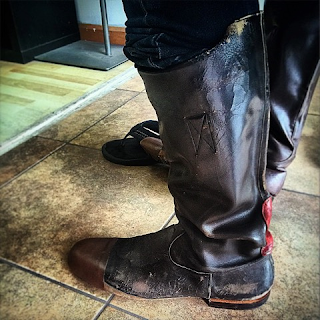 He will even be wearing the same boots that his father wore in the show. And before you stretch the metaphor of filling his parental shoes, let it be said that he's his own man, with his own quite admirable instincts, a tower of strength and offstage the kindest milkman you could hope for on any route. Golde will be played by Allyn Morse, (daughter of another musical comedy giant, Robert Morse, recently of “Mad Men”), who shares her father's labile face and conveys a critical sense of maternal strength and warmth. Together, to echo Yente the matchmaker, they're a perfect match. At the very first rehearsal, the company spent an entire three-hour evening on the first scene of the show, and well they might, as it's crucial, and arguably the finest opening number (“Tradition”) ever conceived for any Broadway musical. In the space of seven minutes, the audience learns not only how important traditions (especially religious tenets and taboos) are to Tevye and his family, but also the role of each of them within that context. His wife Golde may be old-fashioned and superstitious, but his daughters are decidedly not. The eldest seeks to marry her chosen spouse, not one chosen by the matchmaker; the next in line asks for her father's blessing, but not his permission; the next in line chooses to marry outside the faith. All three events are subtly suggested in the song with comic turns regarding matchmaking, poverty and the distance from the ruling Czar; each will have an impact on the story before its final scene. And this is accomplished by a cast that, to quote comic George Gobel, makes one feel "like a brown shoe in a room full of tuxedos". These are one's first impressions of this fledgling company under the meticulous care of its director, Ron Fassler, who once trod these same boards in “Fiddler on the Roof” himself. And all the while, there are the ever-smiling producers sitting in the auditorium and taking all the wonder in. That would be Sandy and Bob Malone, and he too once performed in this same venue years ago in, naturally, “Fiddler on the Roof”. That's a lot of history, and one impressive village. The Cast of "Drowsy Chaperone"
When “Drowsy Chaperone” hit Broadway in 2006, it was a true sleeper, as no one was prepared for how popular it would prove. Now being presented as Cape Playhouse's second production of the season, It's billed as “a musical within a comedy”, and that indeed it is. First performed in 1998 in Toronto, it evolved into a full-fledged Broadway musical comedy eight years later, running for almost 700 performances, with thirteen Tony nominations and five Tony Awards (including, notably, Best Book and Best Score) and seven Drama Desk Awards, as well as five Olivier Awards for its London production. Many (this critic included) felt it was the best musical of that season. A parody of the silly musicals of the twenties, with its ditzy chorine, comic gangsters, mistaken identities and even an aviatrix, it was immediately embraced by musical comedy buffs as the loving valentine to the form that it was intended to be. With the Book by Bob Martin and Don McKellar and Music and Lyrics by Lisa Lambert and Greg Morrison, it emerged as one of the most original creations in memory. It's the story of an agoraphobic man living alone with his theatrical memories and LP collection of Broadway musicals, specifically the 1928 (fictional) musical special favorite of his, “The Drowsy Chaperone”. The protagonist, identified only as Man in Chair (Simon Jones), suffering from some “non-specific sadness”, or what he calls feeling “blue”, finds comfort in playing his recording of the score. He narrates the plot and presents the characters to the audience, introducing such stereotypical characters as Mrs. Tottendale (Jo Anne Worley, of “Laugh-In” fame, who played the role on Broadway for eight months in 2007, and is fondly remembered from the wacky 1966 musical revue “The Mad Show”) who's hosting the wedding of Broadway diva Janet Van Der Graaf (Julie Kavanagh) and oil magnate Robert Martin (Danny Gardner), his best man George (John Scacchetti), the titular Drowsy (as in “tipsy”) Chaperone (Michele Ragusa), Mrs. Tottendale's employee known only as Underling (James Dybas), Broadway producer Feldzieg (Bill Nolte) and note the reversal of name from Ziegfeld, as well as aspiring chorine, Kitty (Kristen Mengelkoch). There's also self-proclaimed Latin lover Aldolpho (Craig Laurie), the aforementioned aviatrix, aptly named Trix (Dan'yelle Williamson), and two Gangsters (Ben Liebert and Elliott Mattox), these last two disguised as pastry chefs (don't ask). The cast also includes a Superintendent (played by Cape Playhouse intern Gus Cuddy), and a dancing ensemble of two, Lauren Kadel and Karen Hyland, in multiple roles (including as a pair of monkeys). As helmed here by Director Pamela Hunt and Choreographed by Shea Sullivan, this production is, well, swell. The hilarity is on a high level, notably in the numbers “As We Shuffle Along”, “Message from a Nightingale”, and “Love Is Always Lovely in the End”. Then there's the ironic “Show Off” wherein Kavanagh dismisses countless song conventions while simultaneously executing them, a satirical hoot for musical comedy buffs. It's difficult to describe the rest of the show without too many spoilers, but suffice it to say the scenes when the record skips, as well as quite a few other tongue-in-cheek homages to clichés of old musicals, including spit-takes, make this one enormously funny show. The performances from all thirteen cast members, are superb, especially Mr. Jones and Ms. Worley, but the entire company shines. The Musical Direction by Michael Rice, leading an orchestra of nine (including himself on keyboard), the extraordinarily clever Set Design by Nicholas Dorr, the excellent Lighting Design by Erick Fox and most especially the many fabulous costumes by the wondrous Jose Rivera, are all topnotch. If you've never seen “Drowsy Chaperone” before, or it's been a while since you last saw it, get thee to Cape Playhouse where it's being delightfully performed by a hugely talented cast. As Man in Chair says when referring to an overture, this is like a pupu platter of tunes. Your record collection may never seem the same again.